1st, 2nd and 3rd Degree Exemplifications THIS SATURDAY at St. Pius X Parish in Southgate! We have a VERY RARE OPPORTUNITY in that we are HOSTING a District 1st, 2nd and 3rd Degree ceremony (one of the last in the State of Michigan) AT OUR PARISH of St. Pius X in Southgate THIS SATURDAY, JUNE 24th, which doesn’t happen often. THIS IS A ALL-HANDS ON DECK event for our Council! There will be exemplifications of Admission Degree (1st Degree), Formation Degree (2nd Degree) and Knighthood Degree (3rd Degree) on Saturday, June 24, 2017 at St Pius X Parish, 14101 Superior St, Southgate, MI. Dress code is coat and tie to match the dignity of this event. Since we are hosting this, I want to make a good showing from our Council. 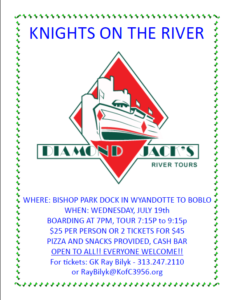 If you can attend this event, please contact me IMMEDIATELY by email at raybilyk@kofc3956.org or by calling 313-247-2110. We need this so that we can reserve a spot (and food) for you. Officers and Chairmen/Directors are STRONGLY ENCOURAGED to attend this in order to make this event a success! 3rd Degree Brother Knights who sponsored someone should attend with their candidates or 1st Degree Brothers. 3rd Degree members are also encouraged to attend these exemplifications not only to welcome our new Brother Knights, but to see the updates that have been made over the past year or two to the degree work. It really hits at the strengths of who we are as Knights of Columbus! Our Supreme Council Field Agent, Tom Jackson, will also be on hand if you have any annuity or insurance questions or needs. Again, I need to know IMMEDIATELY if you can attend!!! I really hope to see you this Saturday to help me welcome our Brothers as FULL Knights of Columbus! I regret to inform you that Robert Crandall Sr., father of Brother Knight Steven Crandall passed away on Saturday, June 3, 2017. He was 88 years old. Beloved husband of Sharon Crandall. Loving father of Cheryl (Terry) Edwards, Steve (Jackie) Crandall, Lisa (Chris) Grasso and Robert Crandall Jr. Dearest brother of James (Jean) Crandall, the late Doris Swan and the late Ann Marie LeBlanc. Also survived by 12 grandchildren and 14 great grandchildren. There will be a Parish rosary for him on Tuesday, June 6th at 6:30PM at the Thon Center (Thon Funeral Home), 2760 Biddle Ave in Wyandotte. This is NOT a Council rosary, but many of you know Robert and Brother Knight Steven, so I wanted to pass this along. and may the perpetual light shine upon him!